Calvin Francis’s radio career has spanned a decade, and he is now a well-known ‘household’ name. Calvin can demonstrate commitment and flare for anything that he puts his hand too. His credentials are flawless, and he is a renowned professional voice over artist and presenter. 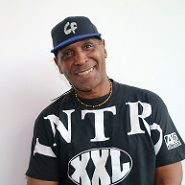 Calvin spent 18 years with Choice FM 96.9/107.1 and presented, The Quite Storm Radio Programme, which featured the best in Neo Soul, Rare Grooves, Classic 80’s, 90’s Soul and Slow Jams. Calvin has hosted some of the biggest shows, featuring acts such as Blackstreet, Snoog Dogg, Jon B, Donnel Jones, Horace Brown, Tevin Campbell, and Angie Stone to name a few. He has played in a whole host of venues including Jazz Café, Dingwells, Corks Winebar, Club Matter Indigo O2, Cafe De Paris, Storm Niteclub, Club Cucci, If Bar, Reading Football Club and many more. Calvin is respected for his musical knowledge, backed up by his private collection of over forty thousand records. He has contributed a great amount to the Commercial and Entertainment Industry. Catch Calvin Francis, Thursday & Friday from 7 pm until 9 pm, only on Mi-Soul radio.